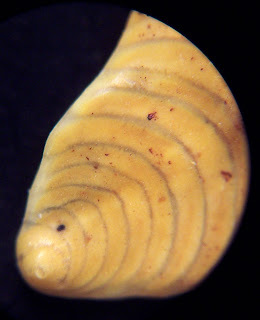 Pictures of the foraminifera Palmula found in Sternberger Kuchen near Kobrow, Germany. These tiny creatures existed in the Paleogene Period (approximately 65-23 million years ago). The specimens were provided by Michael Hesemann of the amazing website (www.foraminifera.eu). 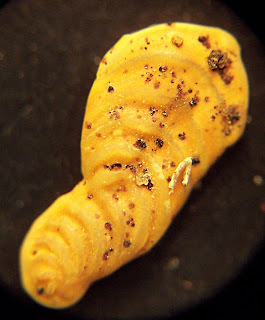 I photographed these fossils with an Orion Microxplore MFL-06 microscope and Kodak Easyshare LS743 camera. These first two pictures appear to be a Palmula obliqua foraminifera. Learn more at this webpage. 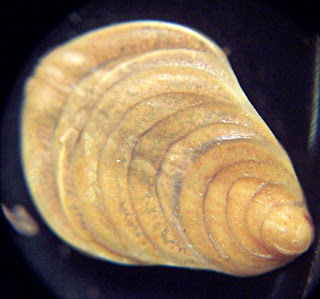 This last specimen appears to be Palmula oblonga foraminifera. See this webpage for more info.